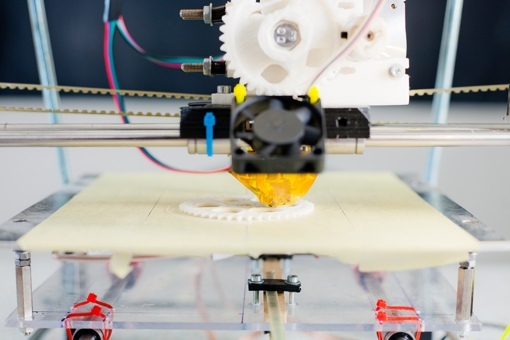 At the moment, the public-facing side of 3D printing is little more than a fun novelty. With the aid of computer models and a plastic-extruding 3-D printer, you can create a wide array of silly physical objects like customized bobblehead dolls and fractal necklaces. Amazon, Staples, Home Depot and the UPS Store are all testing the technology, offering printing services online and in stores of virtually any plastic item your mind can imagine. Those who work in the medical industry, meanwhile, have been pursuing far more serious uses for the technology. As detailed by The New Yorker, a team from the University of Michigan’s C.S. Mott Children’s Hospital used 3D printing to save the life of a three-month-old baby boy in 2012. The tissues that comprised his small airway were simply not strong enough to support normal breathing, so he spent much of his infancy connected to a ventilator. Doctors ultimately saved the boy’s life by taking a CT scan of his airway, creating a 3D model of it on a computer, and designing an implantable “replacement part” for his body – a tiny biodegradable splint that would hold his throat open long enough for his body to naturally repair and strengthen around it. The operation was a success, and the baby was sent home from the hospital without complications three weeks later. In New York City, Dr. Oren Tepper has used 3D printing to perform some pretty miraculous medical procedures himself. When asked to treat an infant girl who was born without a fully formed jawbone, Tepper took a CT scan of her head and created a 3D model of what her jawbone should look like. He then printed the model and used it to aid in physically extending her malformed jaw, slowly stretching it (with the use of a ratchet) until her jaw appeared normal. Tepper now uses the technique in his normal practice. Perhaps most exciting of all is the fact that these simple biodegradable medical devices are only the beginning. The next generation of medical 3D printing is focused on tissue – creating real human body parts out of their component cells. Researchers are already able to print real tissues with built in vascular networks. Now, the goal is to extend this success to create larger organs. If you need a replacement heart someday, doctors may be able to scan your existing one and create a customized working replica for implantation using live cells and a 3D printer. If you want to learn more about this fascinating future of medical technology, I strongly recommend reading the article Print Thyself in the November 24, 2014 issue of The New Yorker. You can also read the article online for free by visiting The New Yorker website. So I wasn’t sold on 3D printing when it first came about, but actually it’s more than just a fad and this proves that the printing actually has a use!